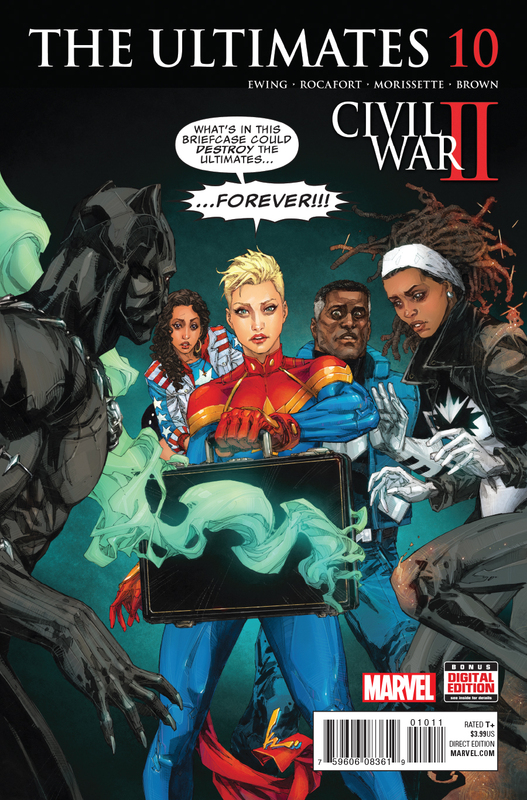 - We get another look at the CWII "brief case scene" from the Ultimates view point. Basically, Adam doesn't like it, T'challa is concerned about it and taking notes on what may need to be done to stop it, and Chavez is all about stopping it now, with her fists. - Cut to the preview scene where Chavez throws a chair. She then takes care of Monica by sending her to a different dimension. - Carol asks T'challa to do something... he responds that he is but sitting back and taking notes essentially. And then says he will take aciton as he sees fit, and she will know it. - We also have the Thanos/Anti-Man plot line. In the page 1 review from Vogt, we here that they aren't sure Thanos even has psychic abilities... we know that he doesn't though as he manipulates Anti Man to breaking out of his cell and killing two people. - The break out gets the Ultimates attention, T'challa didn't think that was even possible. The breakout causes power to go out for a few seconds... which is plenty long enough for Thanos to break free. - This was easily my favorite issue so far. I have really liked the issues on Earth a lot more than the abstract space stuff. - T'challa was pure Priest T'challa here. Sitting back, observing, and thinking of counter-measures... when its appropriate. - The next issue should be insane. Ultimates vs Thanos. The continue schism of the Ultimates. And hopefully, we start to see what T'challa is planning.